Standing in the checkout line….I couldn’t resist snapping a quick shot of this little guy’s feet. I was reminded of my “boys“. They were not very old when my dad asked to take them shopping for their first pair of cowboy boots. When you live in rural Oklahoma, you wear boots. Yep. They are more than just boots. 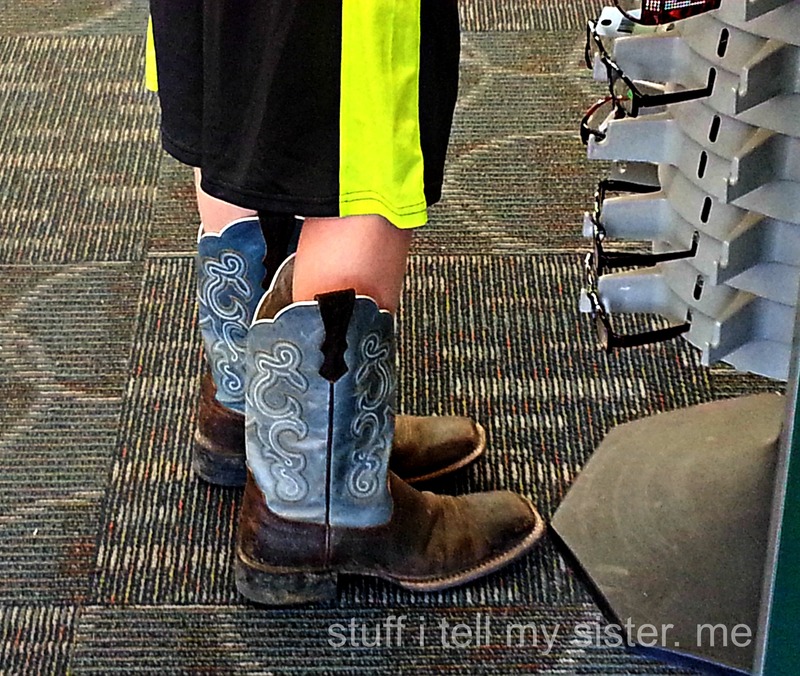 This entry was posted in Family, history, Oklahoma, photos, Reflections, Relationships and tagged boot culture, boot tradition, boots, checkout line, Cowboy boot, cowboy boots, Oklahoma, Rural Oklahoma, Shopping with papa, The Oklahoma way, wedding boots. Bookmark the permalink. You have such a neat perspective on things..and really ‘see’ things…so nicely done PSB! Do YOU? Come visit….I have a place I must take you and get you both boots! Same here in Texas; more than just boots! It’s a way of life! It’s a great traditional dress. Practical too for life in the country. You love for where you live shines through. Cowboy boots are cool! Had three sons and not one of them ever asked for boots. A middle of the country thing I suppose. I want a pair! I wear Red Wings.. Still have my very first pair love them although they look like well… I don’t know only that I have had them since 1984 and they are still my favs. Those boots are pretty big if it’s just a kid wearing them! Interesting perspective though. I live in a place where almost nobody wears cowboy boots, aside from in a novelty way. Doesn’t matter if you’re dancing, at a wedding, or working in the yard, a great pair of boots always fits the occasion. I don’t “like” this post, I love it! I agree, my boys went through the same phase. My daughter was maid of honor in her best friend’s wedding lately and the entire wedding party wore cowboy boots even the bride, the guests were encouraged to wear them too. It was by far the best wedding I have ever been to! Shortly after my dad died, I moved to Abilene, Texas and started my first “real” job as a single mom. With my first paycheck, I bought a pair of cowboy boots I’d been admiring for oh, so long. They no longer fit, but I can’t make myself get rid of them. 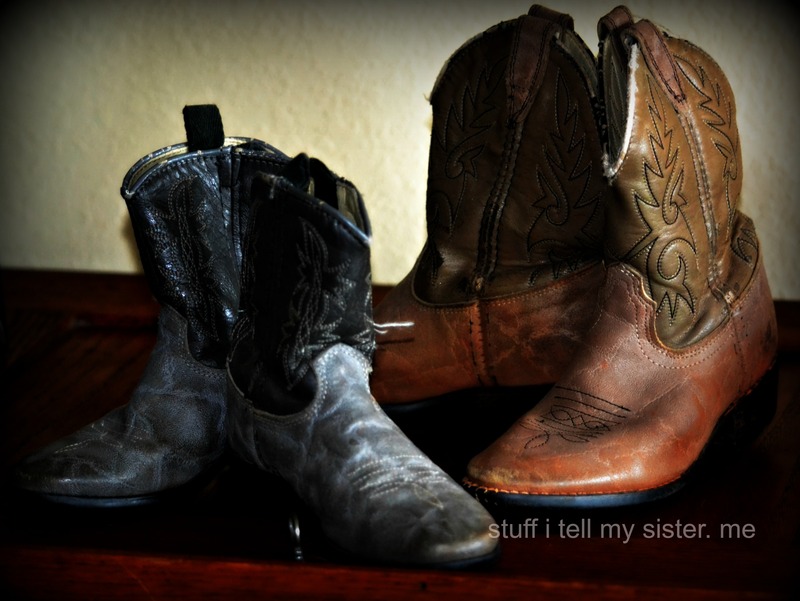 They are definitely so much “more than cowboy boots” and have such strong memories attached to them. Thanks for that little trip down memory lane! Totally understand, Christi! My boots here….after having kids, etc….no way they still fit! But they still hang out in the closet with the other ones. 🙂 Thanks for reading ♥ Appreciate you! I don’t get the whole cowboy boot thang. I have bunions so I don’t like to wear anything stiff. I have some rubber boots for working in the yard and I hate them. They don’t fit right and they bang my calves. My Dad, now 83, has worn cowboy boots forever and ever. Used to wear the shirts, too. I wish I “got” this. Love it! And there are some really pretty ones out there, too! 🙂 You seem like a cowboy boot kinda guy, too! I grew up with cowboy boots. My theory is that if you can break in a good pair of boots, there’s no problem with wearing a pair of 3 inch heels. what a sweet post, i especially liked the shorts and boots fashion combo. 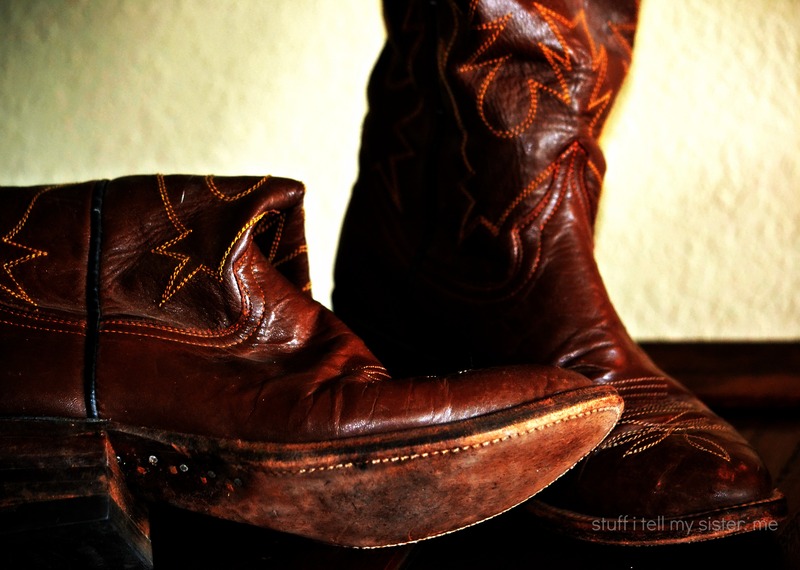 i owned one pair of cowboy boots when i lived in NY, and i wore them so much, they could no longer be repaired. 🙂 Boots with everything around here. 🙂 I’m glad it’s finally considered the “norm”. 🙂 I have my favorite pair of boots that are still hanging in there. I hope you run onto another sweet pair one of these days!